I don’t suppose I’m am alone in being completely submerged in The Olympics over the past two weeks. Visits to the plot have been planned with military precision to fit in with the events I want to watch and when at home I have to be dragged away from the television for even a minute. So what I’m working up to here is that food has to be quick and easy also at a push I must be able to eat it from a bowl on my lap whilst firmly glued to the sofa. 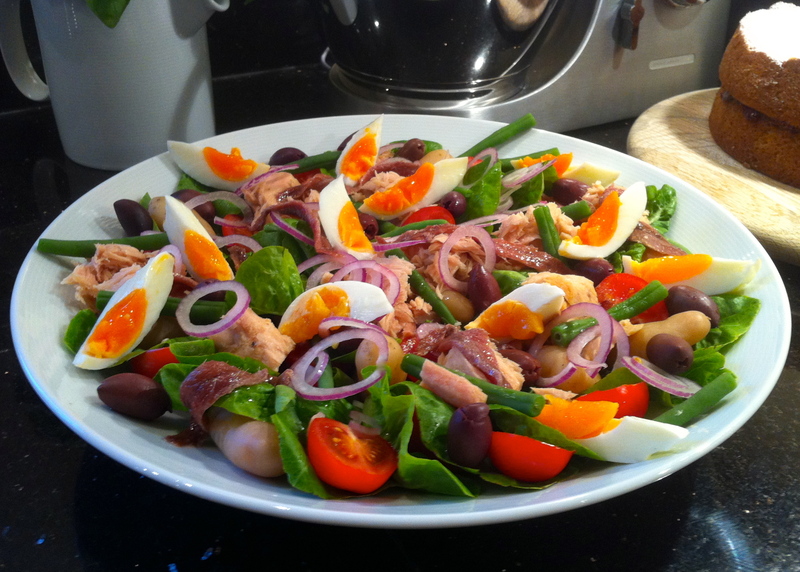 At this time of the year given all the spoils available from the allotment Niçoise salad is practically store cupboard and surprisingly sustaining through the emotional roller coaster that is the games. 200 – 250gm Tin Tuna Fish In Oil – Drained and flaked. 30gm Tin Anchovy Fillets In Oil – Drained. 2 Hard Boiled Eggs – Peeled and sliced. Tomatoes – Halved or quartered depending on size. 1 Red Onion – Finely sliced. French Beans – Lightly steamed or boiled. Black Olives – As many as you like. No method really, just chuck it all together as you like and dress with the olive oil and lemon juice. If your being civilised and eating at the table this looks great in one big dish, otherwise serve in two bowls. Dive in (yes we’re watching Tom Daley) and enjoy. I just processed your blotanical submission. It doesn’t happen often…..I really LOVE your blog. It is the perfect ratio of food and veg. I’ve copied your strawberry shortcake recipe to try later. Thank you so much. Thank you so much Erin. I really appreciate your support. Let me know how you get on with the shortcake. V.
Yes you can. Let me know if you need some beans and I’ll bring some on Tuesday.